Superheros from the DC universe were summoned to Mount Faber for a Super Heros day. The mission was to battle The Joker who terrorized Singapore. 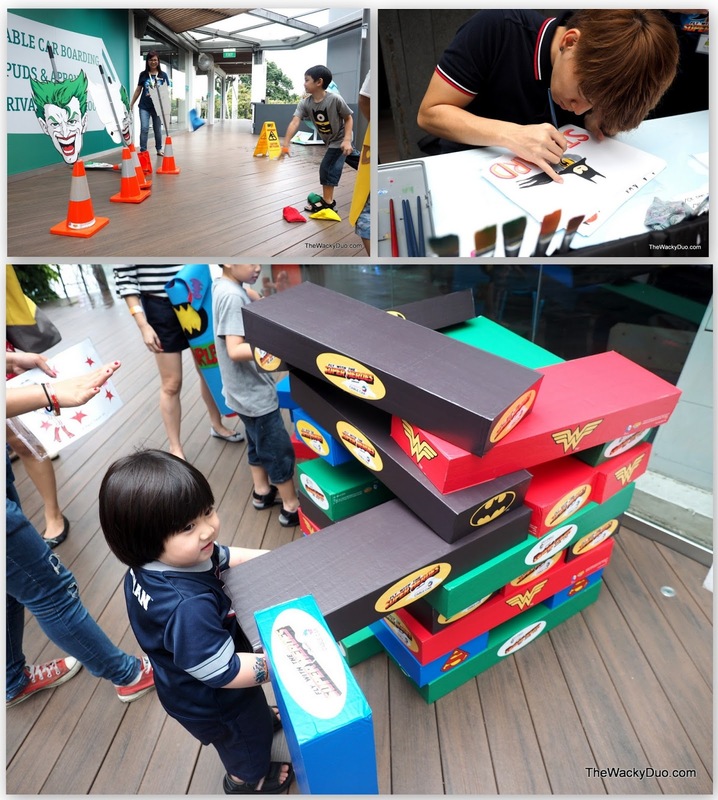 Mission base will be at Faber Peak Singapore where the quest to search for the Joker begins. 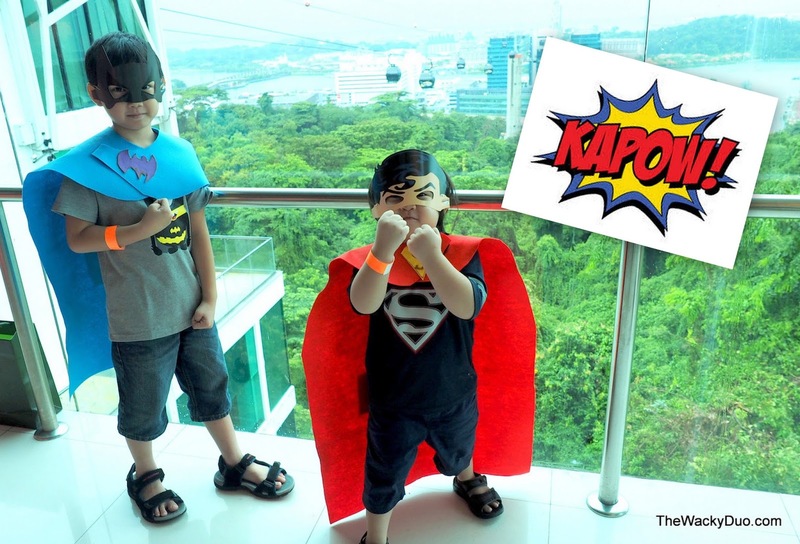 Let's Fly with the Superheros today! Superman, Batman , Wonder Woman and Green Lantern from the Justice League are at gathered here to combat evil and save the day. 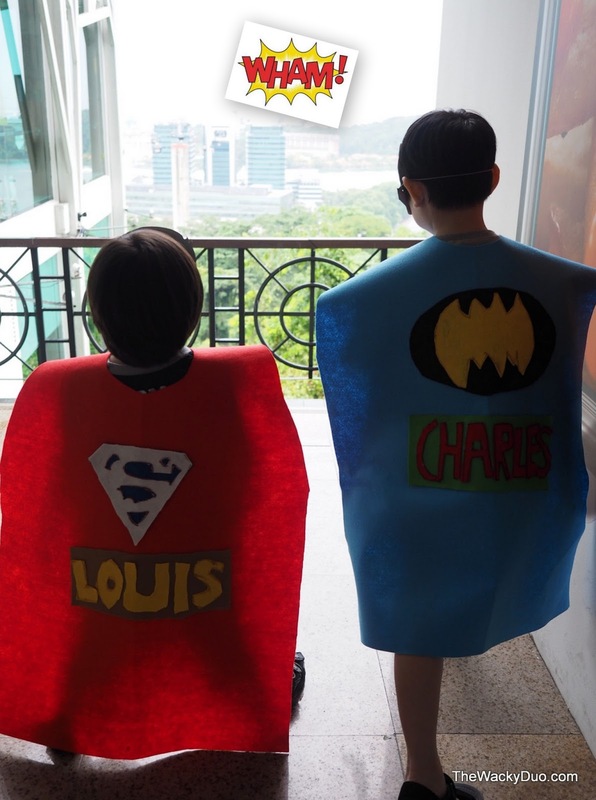 Before they do so, they would have to make their own capes for flight as they had left their Super costumes at home. Yes , Superheros make their own capes. Do you really think have a tailor to do it for them without revealing their secret identity? Once the Superheros are equipped , best of pals , Batman and Superman are ready to do battle with the elusive Joker. Since Batman cannot fly, the Superheros search for an alternative transportation for their mission. The Singapore Cable Car has been identified as the perfect vehicle to combat evil and save the day. Fly with DC Superheros ! 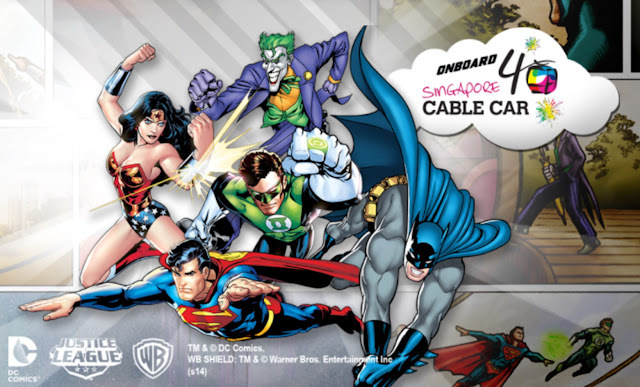 Singapore Cable car which is celebrating its 40th anniversary , will feature 45 cable car cabins deck out in ' DC comic Super Heros' graphic wraps on Bohr the interior and exterior. We took the Batman Cabin and we were in for a surprise. To experience an Augumented Reality wih the Superheros on board, first down land the apps from Apple Apps Stores or Google Play. The good news is that Faber Peak provide you wireless connection that allows you to download the Apps for a complete experience . The App is easy to use. Switch it on, turn on the camera option, point it at the Super Hero code and voila, the action begins! 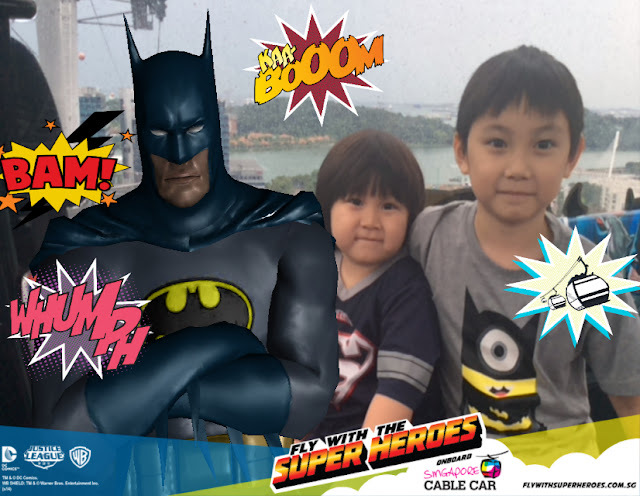 The boys had so much fun with it that they missed the scenery outside throughout the 20 minutes flight from Mount Faber to Sentosa and back. 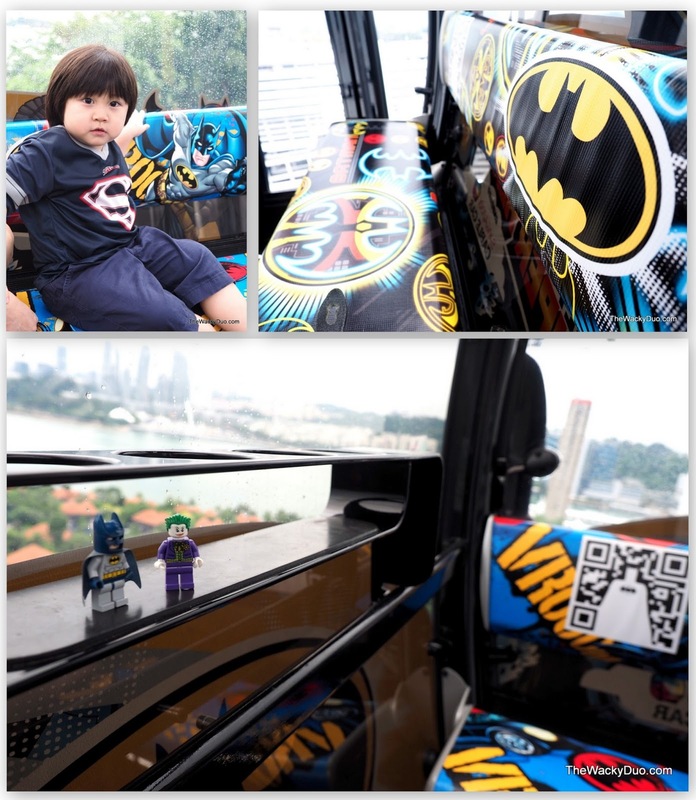 After all, how often would you be able to take a selfie with Batman in the cable car? We did not forget our mission in the midst of all here fun. The Joker did appeared during the flight and we eventually got him towards the end! 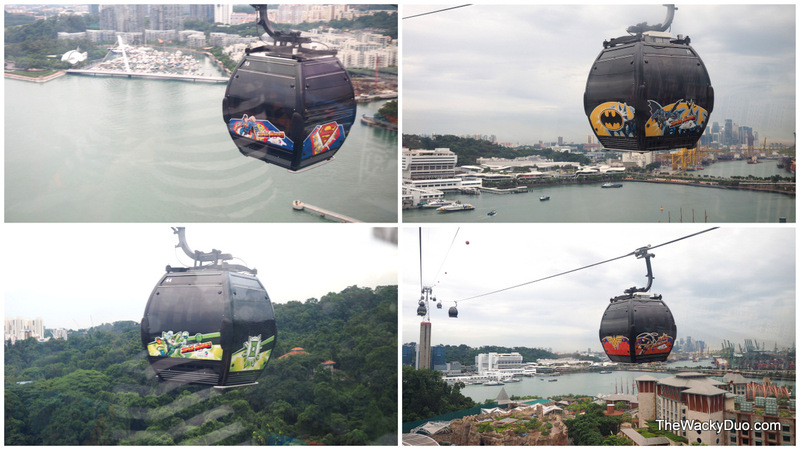 There are a total of four different experiences within the Cable car, choose your favourite Superheros Cable car cabin from Superman, Batman, Wonderwoman or Green Lantern. Each flight cost $29 per adult and $18 for children (age 3-12) . Each ticket includes a Superheros Cable Car ticket, mask and source nicer booklet. To experience all four theme cabins within the day, just add $10 to the ticket price. For an immersive and differentiated experiences, there are also exclusive campaign merchandise and fringe activities for the young at the heart of Faber Peak. The fringe activites are available only during the June hoildays during the weekends. Highlights include meet and greet sessions with characters, an interactive motion experience, exclusive campaign merchandise and more. Photos opportunities are aplenty at Mount Faber Peak. Other than PICTUREMEX that allows you to create your own flying experience, there are opportunities with 3 D life- sized Super Hero Statues at Faber Peak. 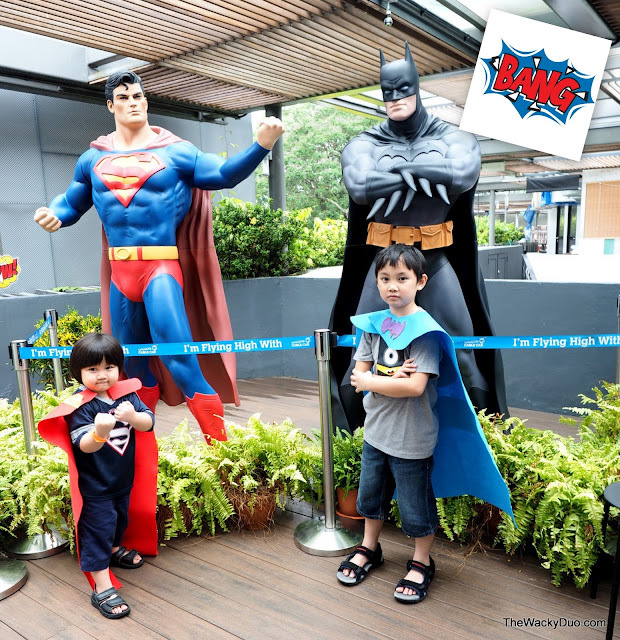 Even the real Superheros could not resist in posing a photo with their 3D life size statues! Fly with the Superheros with Singapore Cable car!